To share time-sensitive fishing information and relay real-time conditions on the water, I’ll be more active on Twitter. Last night at about 4:00 PM, I mentioned via Facebook that I would live-tweet a fishing trip starting at 5:30 PM. I’ll do this more often. Be assured that I won’t mention too many locations, but I’ll be specific about the patterns and techniques we encounter. I’ll also tweet pictures of the fish we’re catching, provide sonar shots, and share thoughts and details about hot lures and techniques. If you missed last night’s feed, you can read it on my Twitter page – @shawnkimbro. You can also follow me there to get the info live as it happens. I can’t do this all the time, but I’ll re-post last nights feed here, with some additional details and commentary inserted in italics. I’ve also cleaned up spelling and grammar since I use Google Voice instead of trying to type on my android touch-screen with wet hands. All the pictures (click the Twitter links) including the one to the left were tweeted live from the water. *I actually started a little earlier with a few preliminary details. Quick stop at @Anglers – picked up 6″ Gulp Jerk Shads and some metal lures. Ran into Rich Jenkins. *Rich has been sick for two weeks and hasn’t fished. I think he was chomping at the bit to get back on the water. Good fishing intel today – crossing #Bay Bridge now. Hazy. Thunderheads to the west. Moderate outgoing current. *My commute home across the bridge is a great information source. I pay close attention to current and wind patterns on the water below and note where people are fishing. I usually recognize a boat or two so it also helps to see where good fishermen are casting. Noticed three boats on the sewer pipe and one casting to the pilings. Trying to decide from which side of Kent Island to launch. Quick change of clothes then met Rich Jenkins and Nick Borneman at Kent Island Depot. Heading to shipping Creek ramp. *My dad taught me to always prep the boat for the next trip the night before. That way, in the limited time I have to fish in the evenings, all I have to do is jump in the truck and head to the ramp. I’ve done this since I was 13-years-old. On the water at shipping Creek. Water looks dirty. Wind about 10 miles per hour out of the South. *A lot of the tributary creeks are seeing algae blooms right now. It’s keeping the fish out of the shallows and in deeper water. On the other hand, water quality in the Maryland portion of the main stem of the Bay and in places like the lower Choptank River and Eastern Bay is as good as I’ve ever seen it. This is the first time I’ve seen stripers holding consistently in depths up to 40-feet. Clean water = good fishing. Birds working off Romancoke Pier in 11-feet of water. Passed them by. *Not always, but usually, especially this time of year, it’s just small fish breaking in that shallow. Not worth a look. Birds circling high over a ledge put us on some fish. Small fish with some bigger mixed in. Bigger fish on the bottom. Rich’s first fish over the rail was 24″. I’m taking off a 21″ now. Got a fish on my first 7 casts. 5 were keepers. Hot Rod chartreuse BKD, three quarter ounce jig head. *I could have caught on more consecutive casts, but Rich called BS because I was just dropping straight down and keeping the lure in the water until a fish bit. We’ve lost the fish now. That’s what I get for getting cocky. Back on the fish. Ran 4 miles. Looking for birds and checking ledges. Still plenty of current. Still in Eastern Bay. Back on the fish. Birds put us on them this time. In water 35 feet deep over a ledge. Back inside E. Bay. *The fish in this school were running bigger than the previous two. 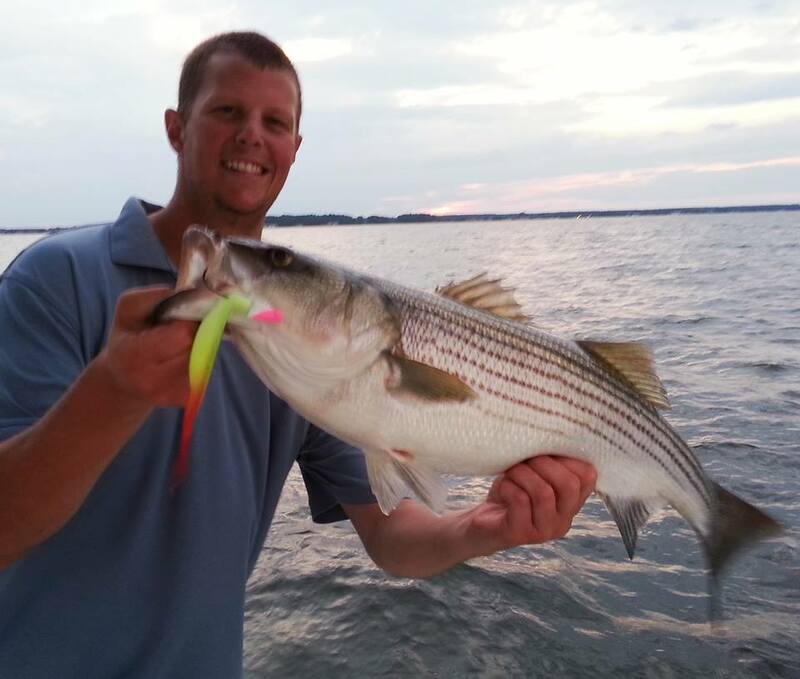 Rich was using a wide 7″ soft-plastic lure on a 1-ounce head. Both Nick and I sized up our baits. *Nice marks on the sonar, open water, big fish. Still a few smaller fish breaking on the surface with an occasional big fish explosion nearby. I considered throwing topwater for a while, but thought the smaller fish would get to my lure before the big ones. *Nick was in the zone now and catching on almost every drop. Timeout for a @CCA Maryland conference call. *Important issue so I need to multitask for a while. The Maryland Department of Natural Resources seems reluctant to make modifications to our speckled trout fisheries management plan. Recreational fishermen need to draw a line in the sand on this one. I’m pissed. Expect to hear a lot more about this. Finished conference call and we’re still on fish. Fish finder is still lit up. The bite has slowed a little. *The call lasted more than 45 minutes and we stayed on the same drift the entire time. 7 or 8 overs so far. Rich says it’s getting harder to pick out the big ones. *An over is a fish over 28 inches. I think Rich had two or three over 30 inches as well. You’d never know he’s been sick. Still on top of his game. My reel handle just broke and I hit myself in the nose with my fist. That hurts. Guess I was jigging too hard. *BassPro Shops ProQualifier reel. I use cheaper BPS reels in the summer because of the off-the-shelf warranty. With all the fishing I do, I wear out reels fast and I don’t like to take the time to send them off to a warranty shop and wait months to get them fixed. Apparently, one of the trade-offs is a bloody nose! We’re off the fish. Still marking a few, but not catching. Time to move again. Still marking fish but hard to get them to bite. I switched to a more vertical presentation instead of casting. It worked. *I’m a little slow sometimes, but it finally occurred to me that, when I don’t like my results, I should do something different! Starting to get some wind and rain from a nearby thunderstorm. *We were lucky so far as storms had stayed north of us. We could see lightning in the distance but mostly to our north. I read this week that fishermen are more likely to be struck by lightning than those participating in any other activity. Not surprising. *I moved about a mile and found another nice school in open water. Now Rich is really on fire and Nick is landing nice fish as well. Really good fishing right now. One big fish after another and all overs. 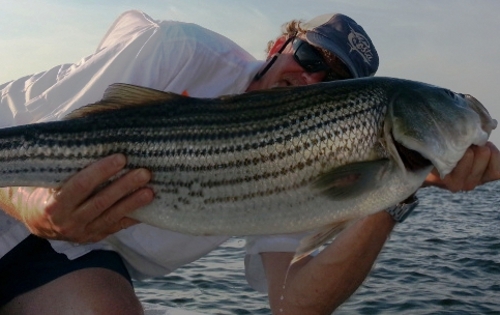 *Ever hear anyone say, “never leave fish to find fish?” That guy doesn’t catch many big fish. I say, ALWAYS leave fish to find bigger fish. 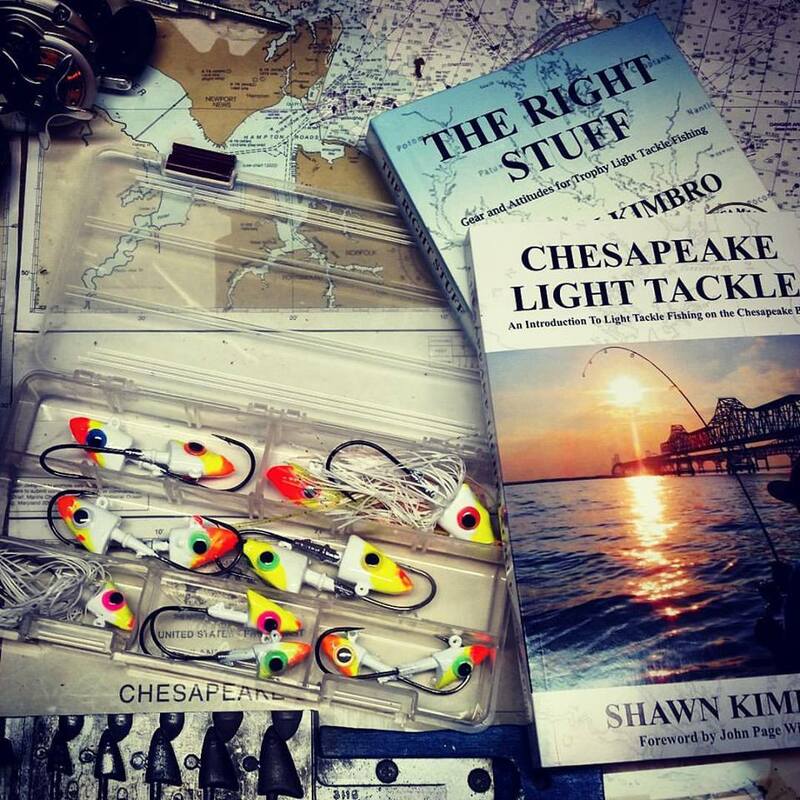 When conditions are right for fish to bite on the Chesapeake Bay, they’ll be biting at more than one place. When the bite is on, look for schools of big fish. Nick with another nice fish. pic.twitter.com/TGeVuQhBau We’re in 32 feet of water. These fish aren’t relating to anything but bait. *Except for Rich who was still hooked up! Calling it a night. Rich says one more cast. Back at the ramp. Lost count but at least a dozen overs. Biggest 33. Fun night. Same pattern I’ve been seeing in eastern bay. Small fish in shallows or on top with bigger ones deeper. Some days it takes a lot of looking but when you find them it’s worth it. 32 feet has been a good depth for me as well. I’m glad you guys didn’t have to resort to metal. 😉 Strange how at times they wanted it vertical. The play-by-play is kind of neat! That is some serious multi-tasking! I’d be missing fish…and my phone!